Chronic health conditions or a serious illness are a big reason why many aspiring full-timers don’t hit the road—and who can blame them? But while there’s no doubt that managing health care needs (and going full-time with an Illness on the road) can be challenging, Christina Harris is proof that full-timing with illness doesn’t have to end your dream. 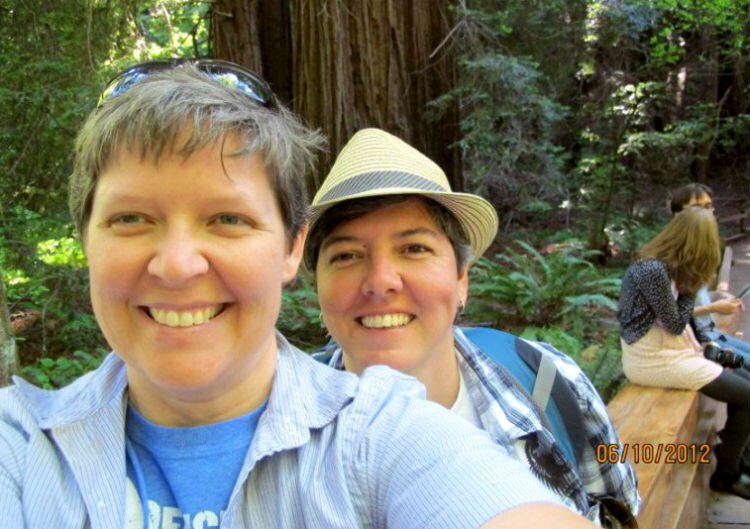 Christina was 38-years old when she and her partner Jena, 41, hit the road in their Lazy Daze motorhome in search of adventure. As a remote worker for an Internet-based company, Christina knew she could make a living anywhere. Jena opted for short-term work in carpentry and state park volunteering. Together the possibilities were endless for these Floridians, but after two years of meandering around the U.S., their lives turned upside down when they were staying in Key West. That’s when an ear infection sent Christina to the doctor and put the ball in motion for a course of life-changing events. “I decided that I’d go to the VA to have it looked at when we got back to Gainesville, FL,” says the former Navy personnel member. “Gainesville is our home base and we were headed there to volunteer at the Paynes Prairie State Park,” she says. At that point, most people would have ditched their RV for the comfort and security of a conventional life. However, Christina and Jena aren’t most people. Instead of fleeing full-timing, they chose to look for ways they could continue living the lifestyle they loved while coping with whatever was ahead. “We know that we’ll continue to travel and explore no matter what,” says Christina. “I knew it would be a temporary break from traveling, but that it wouldn’t keep us from doing it,” Christina recalls. With less than two months between receiving the bad news and undergoing a double mastectomy, the duo scrambled to adjust. 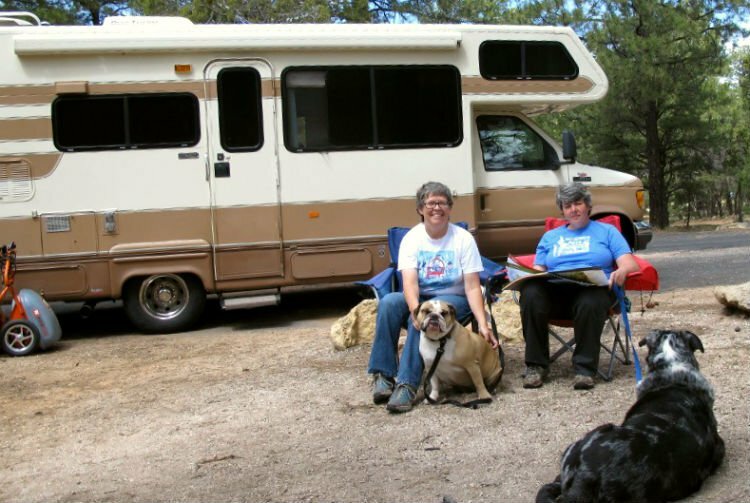 Since their RV wouldn’t provide the required comfort after the major procedure, a program sponsored by the American Cancer Society allowed them to stay in an Extended Suites Hotel. She’s now healed, but her condition requires follow-up appointments every six months. The VA will allow her to receive care anywhere in the U.S. but she wants to stay near her original oncologist. Full-timing with an illness has some surprising bonuses. The ability to move around to accommodate her doctor’s appointments and rehab therapy has been helpful for the couple. Currently, they’re renting a house so Christina can attend physical therapy in a convenient location. In the fall, they’ll move back into the RV and volunteer at some beach-side paradise in Florida. “Once we hit the four or five-year mark with no issues, we’ll expand our travels again to the west or even internationally,” says Christina. Now that time has gifted her with some perspective on all that she’s overcome, the popular RV blogger has thoughtful advice for anyone who wants to hit the road but fears full-timing with illness. The road ahead is as exciting as ever for Christina and Jena and it continues offering lessons about adjusting to life’s most challenging situations. Hi that is courageous and free spirit! Enjoy each and every day doing what you love . Prayers for continued healing and than you for your service. YOU’RE WONDER WOMEN AND AN INSPIRATION BEYOND WORDS! I’m going to be seventy nine. Five cancer battles and the docs saved my foot. I learned to walk ‘n talk again but with the newest news, I was giving up–was going to get a little apartment back where I lived for years in AZ. or go to a commune in NC. AND NOW, HERE YOU ARE! SHOWING ME THAT MY LOVE OF THE ROAD (40,000 miles in my Subaru over 3 years and more than 30 cities/adventures–that I can! I will! I don’t know a thing about an RV, can’t do steps or ladders but can do positive energy. Thank you for sharing your story. This is my first RV Life read and yes, you WOW’ED me! Back in January of 2018, my husband and I both developed a cough. Thinking it to be just a winter cough. When the cough wouldn’t go away, we visited an Urgent Care in Tucson, AZ. The doctor did a chest x-ray and found a spot on my right lung. Our daughter lives in Kansas City, MO. area, and so to be with family, friends, and a good Cancer Hospital, we headed that direction. By February 1,st. it was verified I had Cancer and was in stage 4. My husband did some research and with help from my doctor, I was placed into a Cancer Trial. (immunial therapy). It is now August 1st., my tumor has decreased to less than 1/2 its original size. The doctor has released us to travel for 3 months at a time with returns for check-ups. We are praying for a complete recovery. Just got back from a trip to Maine, and getting ready for a trip to Texas. Happy Trails to all.